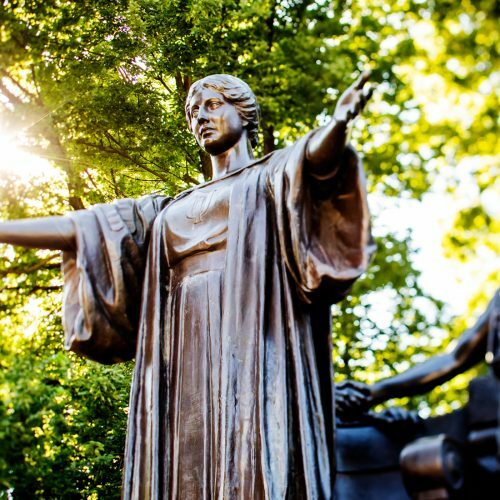 June 30 marked the close of the most successful fiscal year of fundraising for the University of Illinois at Urbana-Champaign. 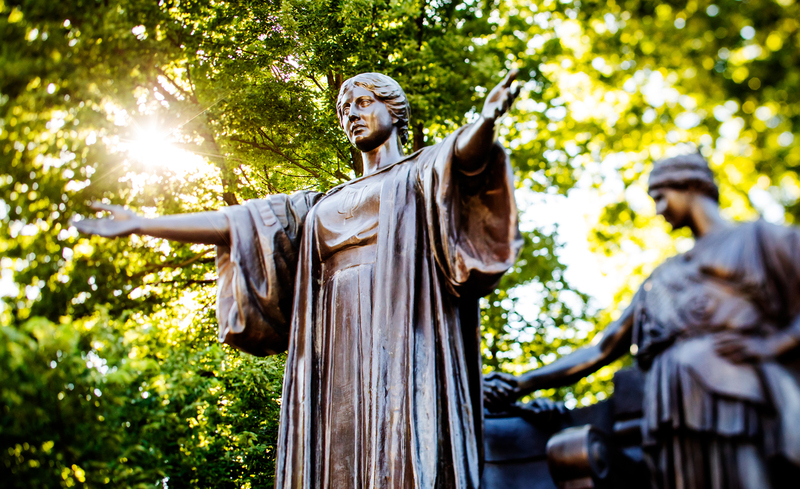 Champaign, Ill.—June 30 marked the close of the most successful fiscal year of fundraising for the University of Illinois at Urbana-Champaign, with more than 100,000 gifts and commitments totaling $415.4 million, surpassing the previous record of $345.3 million achieved in 2013. 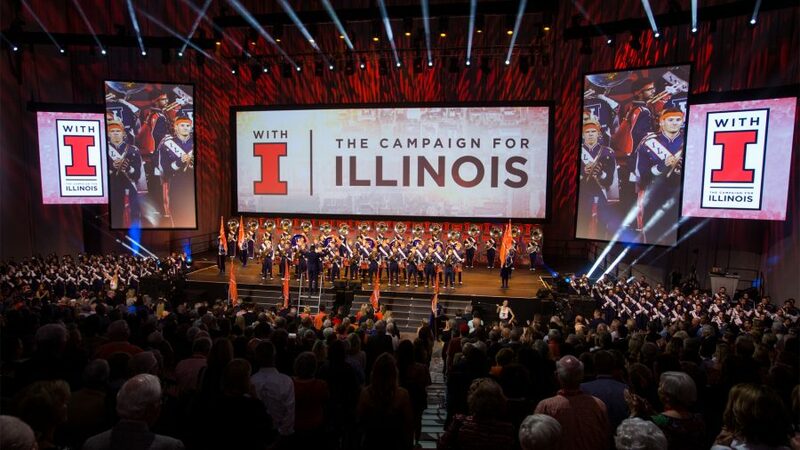 The university also celebrates the halfway point of its ambitious eight-year fundraising campaign, With Illinois. “Thanks to the generosity of donors in all 50 states and more than 100 countries, the university is ahead of pace with over $1.35 billion raised,” said Barry Benson, the Urbana campus’s vice chancellor for advancement. The amount surpasses 60 percent of the campaign goal. Support of student scholarships is one of the major components of the With Illinois campaign, and more than $236 million was committed or pledged in FY2018 toward making the Illinois experience more accessible. The With Illinois campaign launch event, October 13, 2017. Play video. Last October, the university publicly launched the With Illinois campaign at a State Farm Center showcase event. The theatrical production featured distinguished faculty and students, extraordinary alumni and major benefactors through live performance, video, storytelling and inspiring speakers. Over the course of the year, many of the stories shared at the event have made important progress. Pretzel and Breta, the popular canine talent, shared the stage with Paul Hergenrother and Timothy Fan to showcase the success of the drug PAC-1, which was found to successfully fight brain cancer in dogs. Since last fall, the drug has entered human trials. Also featured at the event was the Siebel Center for Design. The university held a ceremonial groundbreaking for the center located between Huff Hall and the Art and Design Building and hired Rachel Switzky as the center’s director, welcoming her back to her alma mater after spending the past 10 years in Silicon Valley working closely with Fortune 100 companies. The Carle Illinois College of Medicine has also made significant strides, welcoming the inaugural class of 32 students on July 2 and appointing Ruby Mendenhall as the assistant dean for diversity and democratization of health innovation. Mendenhall will lead efforts to make the discoveries of the college accessible to everyone. Shortly after the campaign launch, the university also announced the first naming of one of its colleges and the single largest philanthropic investment ever in Illinois. A $150 million gift from alumni Larry and Beth Gies named the Gies College of Business. Larry Gies is the founder, president and CEO of Madison Industries, located in Chicago. More information on the campaign is available at with.illinois.edu/the-campaign. Download this press release in PDF format.